Our first lunch at Ellsworth was delightful and light. We decided to share the prefix lunch option that included an entrée, plat and dessert. 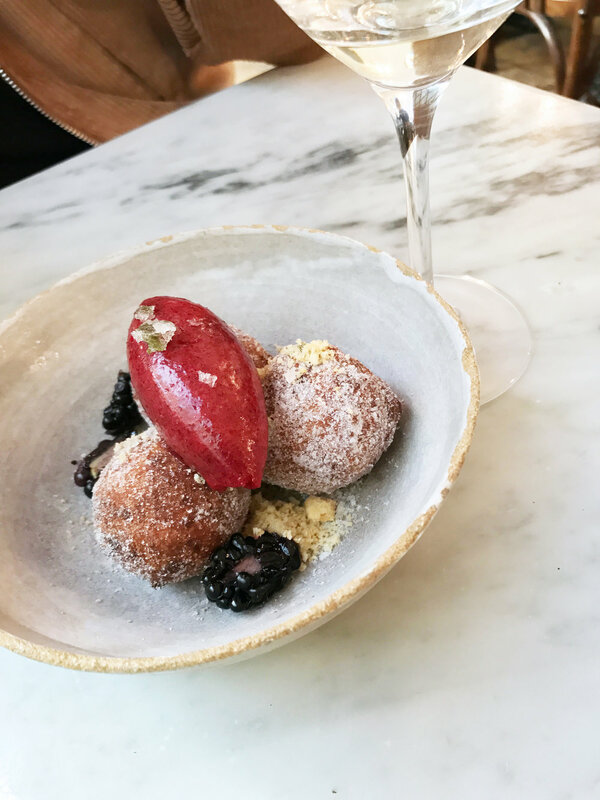 We chose the SMOKED MOZZARELLA DI BUFALA, CAPERS, ANCHOVIES, the LINE CAUGHT SEA BREAM, JERUSALEM ARTICHOKE, KALE and then finished off with the RICOTTA DOUGHNUTS, BLACKBERRY SORBET, SAGE (pictured above)! 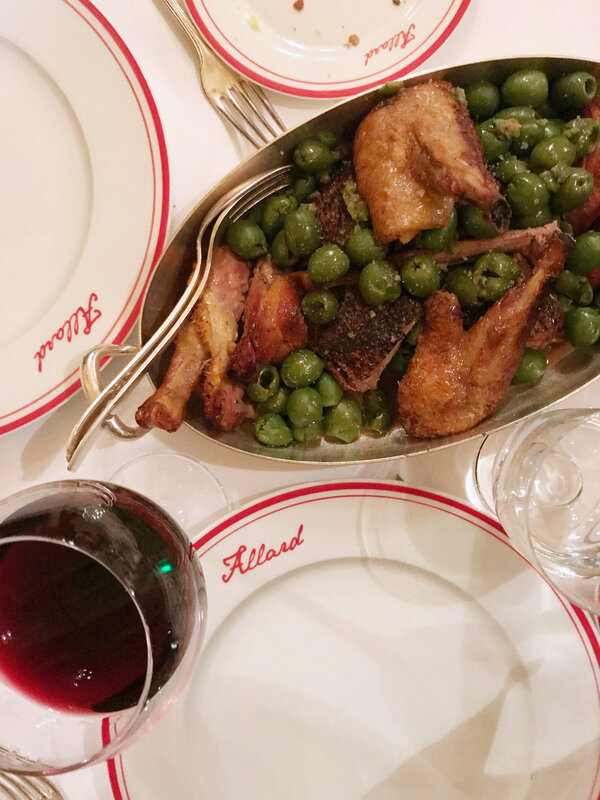 Allard, listed on the Condé Nast Traveler "must try" Paris spots, was the most authentically Parisian restaurants we dined at. They are known for their full duck cooked in olives (pictured above), so of course that's what we ordered. We started with rosé champagne and then shared a mushroom, egg app that they pair with crispy baguette. The duck arrived in a dramatic fashion and was a quite the undertaking to eat, but no less delisous. The staff was lovely and we enjoyed the ambiance imencely. Les Chouettes was absolutely lovely. The food was delish and the two-story dining area was flooded with natural light from the large sun-roof above. A very fun dinner spot with very chic decor and excellent music. Their cocktail menu was quite noteworthy and I ordered the Lautrec Royal made with Piper-Heidsieck Champagne, Greygoose, Raspberry Puree, Lime, Chambord. On our third day in Paris we escaped a rainy walk along the Siene to lunch at the Glover Grill. The decor was gorgeous and the staff was very accommodating. Of course I followed my waiters advice and ordered the burger and fries (I know, I know, it seems SO American, but the French love their burgers too!!). The burger was outstanding coupled with a glass of rosé. I also FELL IN LOVE with the marble throughout the restaurant. I asked our waitress and she let me know that it was Green Valley (Marbre Asiatique). Noted for the future!